In a festive atmosphere that drew people from across the United States, the large marble sculpture of The Annunciation that adorns the front of the Ave Maria oratory was officially unveiled and dedicated Friday afternoon — the Feast of the Annunciation.. Joined by his wife, Ilona, and two daughters, Mr. Váró beamed from his front-row seat as the marble depiction of the Virgin Mary receiving the news from the angel Gabriel that she would bear the Christ child came into view before more than 1,000 people outside the oratory. Pictured, Mr. Váró and his wife, Ilona (R) and daughters Ilona (L) and Kata Anna. 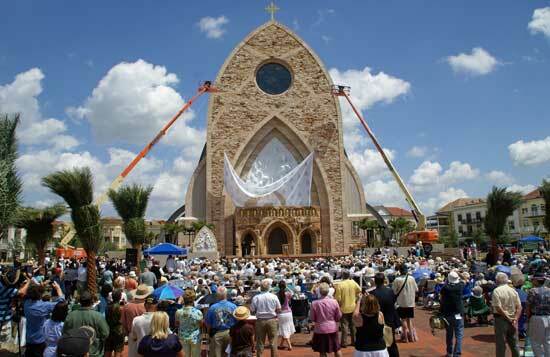 Two students from Ave Maria University sang a newly-composed musical rendition of Ave Maria as the 40-foot cloth that had covered the sculpture since early in the morning was slowly lowered. Father Robert Garrity, AMU’s director of campus ministry, paid special tribute to Mrs. Váró before leading prayers at the start of the dedication. “Thank you for giving us Martón for the last two years, so he could create this magnificent work of art,” Fr. Garrity said. Although the work was officially unveiled today, and blessed and dedicated by Diocese of Venice Bishop Frank Dewane, Mr. Váró still has some finishing touches to do and will continue working in Ave Maria for another few weeks. Left, Bishop Dewane incensing the statue before sprinkling Holy Water in the dedication. Before the official dedication, Bishop Dewane presided at Mass in the oratory that was concelebrated by Archbishop Francis Assisi Chulikatt, the Vatican’s personal observer to the United Nations, and 19 other priests. The events drew people from all over Florida and around the United States. She said she was raised Catholic and was so moved that she intends to start attending church services again. “It’s bringing me back into the Church,” she said.